These guys may not necessarily be your idea of eye candy, but the combo of their wit, geekery and other characteristics makes me swoon a little. I’ve liked Seth Meyers ever since his time on SNL, but I think he really came into his own when he took over Late Night. Granted his opening monologue is pretty much the same stuff he would deliver on Weekend Update, but it’s great. I also adore that he’s not afraid to talk about his wife and kid and he is funny while also tackling the hard stuff. He doesn’t hesitate to do little skits that are just plain silly and is able to laugh at himself while doing it. He straddles the line between Jimmy Fallon and Stephen Colbert and does it so, so well. Oh, Keith. I love his baritone voice. I used to love him on Countdown with Keith Olbermann and was saddened when the show was no more. His style, the way he presented the top stories but also had a slight edge to him – he made things bearable to watch without being boring. 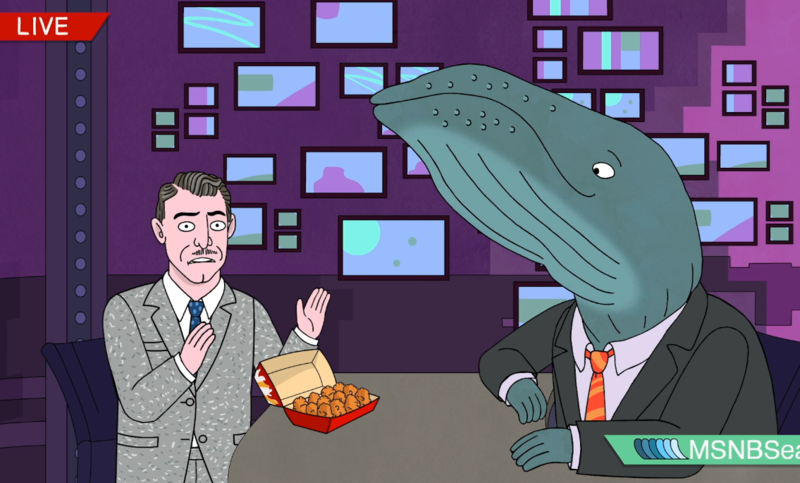 He’s now a voice on the (weird) adult cartoon BoJack Horseman, where he basically plays himself but in whale form. The original crush on Chris Hardwick definitely goes back to his Singled Out days but I love him so much more now in his current roles. 1 – he’s the host of The Talking Dead. As a big Walking Dead fan, I should really watch The Talking Dead too, but I don’t. I do always catch clips of it and it’s witty and funny and relevant to the show – not just pandering to it. 2 – he is a HUGE pop culture nerd and I love it. He is the founder of The Nerdist and the host of The Nerdist Podcast, which is one of my favorites. He interviews everyone and anyone on it from Sarah Jessica Parker to Neil Degrasse Tyson and more. He also helped put together the Ben Folds Five video with Fraggle Rock and will forever go down in history as one of my favorite people for doing so. Last but not least, the OG. I feel like Jon Stewart paved the way for so many, especially in the arena of political, comedic commentary. The day of his last show I felt bereft. And when his old colleagues came out to toast him and Stephen Colbert grabbed his hand to steady him as he stated how much Jon meant to everyone and what he did for the country, I almost lost it. He was another who gave the news in a way that mattered. He didn’t shy away from anything and one of my favorite moments was when he went on Crossfire and destroyed them. Do you have any geeky man crushes? I think I may share my geeky lady crushes soon too! Feisty Harriet recently posted…Not yet. But, soon. I don’t know if mine is geeky, but I love Tony Goldwyn! Jon Stewart will forever be a crush. OMG I literally LOL’d at “keeping things a mystery.” I totally get what you mean!! I MISS JON STEWART SO MUCH!!! I love when he pops up on other shows (Sam Bee, John Oliver, etc.). I think that Last Week Tonight is so good and fills a different role. He is great when he pops up on other shows… it needs to happen more often! Heck, he just needs his own show again. Yes, I love this! Geeky man-crushes are awesome. Here are a couple of mine…. Jon Stewart, Adam Conover, and Seth Meyers. Ok I have to admit I had to google Adam Conover!!! I had no idea what his name was!